The options menu offers several useful options for setting how D20PRO runs and operates. The four main tabs are General, Rules, GM and About. Sound On: Toggles sound on or off. 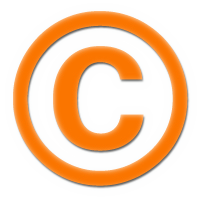 Show ID: Show the token ID# in large text. Mouse Zoom: Toggles if the map should zoom in/out via Mouse Wheel. Allow Hint Popups: Toggle hints on/off. Confirm On Exit: Prompts for confirmation on application close. Enable Tooltips: Toggle Mouse Over text on tools and dialogs. Declare Attacks without Confirmation: Removes GM Decision/Intervention for Attacks. 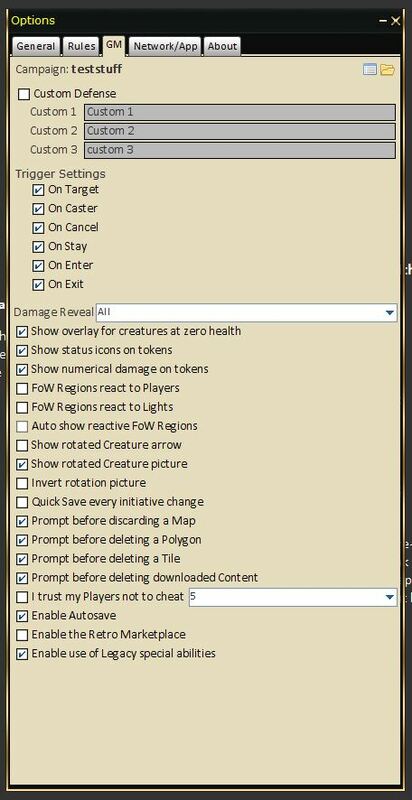 Show menu button when token (creature) selected: Shows the Common Tasks/Right-click Menu button. Prompt before closing windows: Prompts for confirmation on window close. Show Mini Border: Shows the Border Edge on tokens on the map. Map Autoscroll: Toggles autoscroll when mousing to the edge of the screen. Native File Chooser: Toggles the OS file selector vs the built in Java file selector. Opaque Windows: Solid or transparent windows and panels toggle. Show Game Tine: Toggle Game Time display lower middle screen. Use Alternate Sound: Uses alternate sound effect set. URI Trigger: Alters URI trigger behaviors (Local/Remote). Show Random Hint: Displays a random hint. Reset Desktop: Reset the desktop display (App only) for panel positions to defaults. Reset Random Hints: Re-initializes and turns on the random hint system. Reset Context Hints: Re-initializes and turns on the Context hint system. Set Chat or User Font: Allows for setting a font file (custom other language) for the chat system. Delete Chat or User Font: Allows for removing a font file (custom other language) for the chat system. Tile Detail: Allows for limiting or not; tile or image sizes to conserve RAM/Memory. Map Zoom to Settings: Monitor scaling to physical grid. Use F8 key. Diagnal Inches: Diagnol Size of monitor. Show Log File: Opens the App log file in your OS default txt file viewer. Advanced Check Box: Displays some Memory information and tools. Attempt GC (Garbage collection): Attempt to clean memory. Update Memory: Updates Memory information display. Units are Diagonal counts as = This is set in the Judge's/GM's Option Window. Note that the diagonal count will determine the templates size. Power Attack is __ = This is set in the Judge's/GM's Option Window. This will determine what penalty will apply to the attack roll and what bonus will apply to the damage when Power Attack is selected. Fast Skill 1 = This is individually set per player, set this to what skill your character uses the most. Fast Skill 2 = This is individually set per player, set this to what skill your character uses the second to most. Fast Skill 3 = This is individually set per player, set this to what skill your character uses the third to most. Print Template = This is the template used when pressing the "Print" option from the View Creature General Tab. Custom Sheet URL = Custom Character sheet URL. 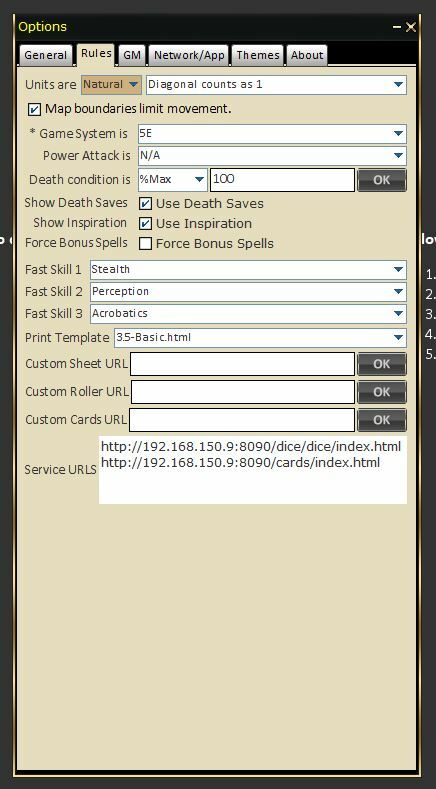 Custom Roller URL = Custom Dice Roller URL. Custom Cards URL = Custom Cards URL. Service URLs = URLs for internal Services. Custom Defense = Toggle custom defined defenses on/off. Custom Defense 1 = Name of custom defense. Custom Defense 2 = Name of custom defense. Custom Defense 3 = Name of custom defense. Trigger Settings = toggles active trigger conditions. Show overlay for creature at zero health overlay = Toggles death image overlay. Show status icons on creatures = Toggles status icons on creatures. Show numerical damage on creatures = Toggles large numbers showing damage amount on creatures. FoW Regions react to Players = When a player moves into a region currently covered by Fog of War, a prompt will display on the Judge's/GM's screen asking to approve revealing the map under the Fog of War Region the Player moved into. Auto show reactive FoW Regions = Automatically approves revealing Fog of War Regions where Players have moved to. Show rotated Creature Arrow = Displays an arrow to indicate figure facing. Invert Rotation Picture = Inverts the picture's rotation. Quick Save every initiative change = Saves the game state at every initiative change. Prompt before discarding a Map = Prompts user if they wish to save or discard a map when closing a map. Prompt before deleting a Polygon = Pressing Delete when managing Fog of War Polygons will prompt a window confirming the delete. Prompt before deleting a Tile = Pressing Delete when managing Tiles will prompt a window confirming the delete. Prompt before deleting downloaded Content = Prompts user if they wish to delete the downloaded compressed data after installing the content into d20Pro. I trust my Players not to cheat __ = Attacks resolve automatically and damage or miss will be displayed on the game log without Judge/GM intervention. The number is the seconds before auto-approve takes place. Enable Autosave = Autosaves every 5 minutes. You can disable this feature inside the Options > Judge Window. Simply make sure "Enable Autosave" is checked. Enable Legacy Abilities = Toggles the systems use of Legacy Abilities. Get IP Address = Will display the Public and Private IP address of your computer. Synchronize View = Will duplicate the map view of the Judge to all connected Players. Refresh Resources = Reloads images from the image directory. Quick Save = Saves the state of the game. Reset Game = Closes all open maps and deletes all creatures from Limbo. Process Images = Allows you to adjust an image if you know the exact specifications on the offset and reduce or enlarge dimensions. Broadcast game when a Player connects = Will automatically broadcast the game state to the connected player without having to manually approve the broadcast game to player. Merge creatures automatically = Allows editing Owned tokens without GM approval, does not prompt decision window. Block Exhausted = Automatically block features with exhausted pools. Enable Retro Marketplace = Uses classic marketplace UI/Experience. Show IP in Title bar = Toggle on/off the display of your IP in the title bar of D20PRO. 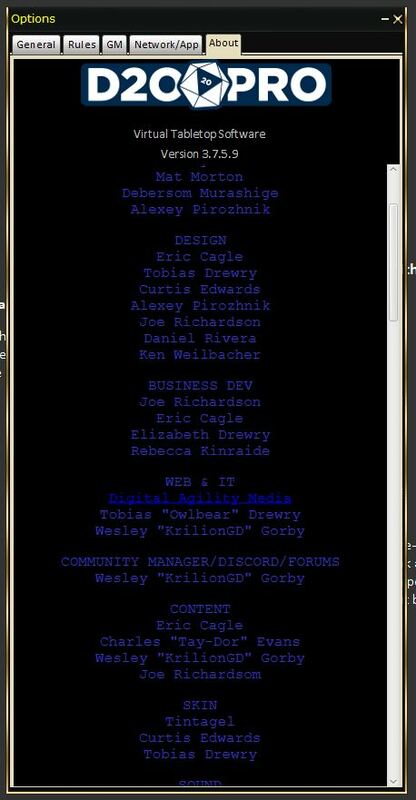 Displays the credits about d20Pro. Also shows version information and credits Team & Beta testers. We are gamers building things for gamers.